Seattle Seahawks coach Pete Carroll may bounce around touting his “Win Forever” mantra, but that doesn’t mean looking ahead to “forever” is all right. In fact, it’s something Carroll consistently warns against. He’s the same each week, touting that seven days as another “championship week,” and he is loathe to talk beyond that. So, let’s do it for him. The Seahawks (6-1) are heading into the end of their most difficult road stretch of the season. When the clock runs out Monday night in St. Louis, they will be done with four road games in five weeks. Included was a Thursday night road game last week after a short week of preparation. The Seahawks took four days off before returning to full practice Tuesday after that quick turnaround. Since their bye week comes Nov. 18, the break was welcomed. Looking down the line, that refueled group will see just two opponents (New Orleans and San Francisco) remaining with winning records. The Seahawks have their bye the week before they play host to New Orleans, giving them two full weeks of preparation for the Saints (5-1) on a Monday night. Seattle heads to San Francisco the next week. But, starting this Sunday, the Seahawks’ remaining opponents outside of those two have a combined 13-33 record. Two, the New York Giants and Minnesota Vikings, have one win each. The Giants picked up theirs against the Vikings on Monday night. Tampa Bay is winless and visits CenturyLink Field on Nov. 3. The Seahawks also close with four of six at home, where they have won 11 consecutive games, one short of tying the franchise record. Which makes considerations of home-field advantage throughout the playoffs for the Seahawks a legitimate thought, even in Week 8. San Francisco and New Orleans appear to be the two main competitors. The Saints have a more difficult schedule in front of them than do the Seahawks or 49ers. Jake Locker Picked number 10 in round 1? Seahawks 12th Man Army has now gone mobile! 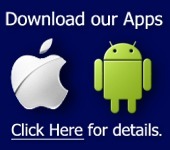 Click Icon to get an app for your phone. It’s free and it has alerts so that you’ll know whenever Seahawks 12th Man Army has anything new. What could be better?